Making soft chappatis/rotis or Indian unleavened flatbread is an art. 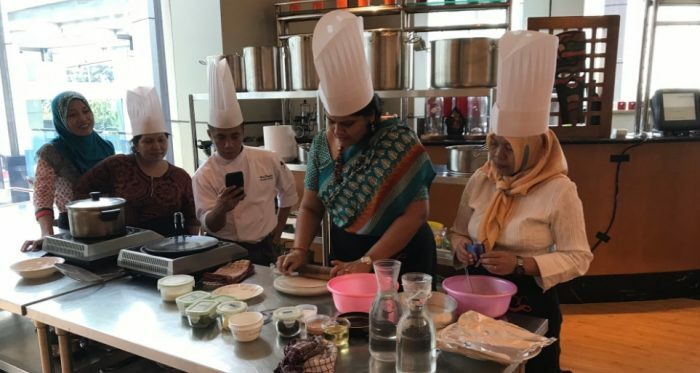 It requires practice to roll the dough into thin round discs. Then it is a matter of experience with the heat required to cook the chappatis to be soft and tasty. 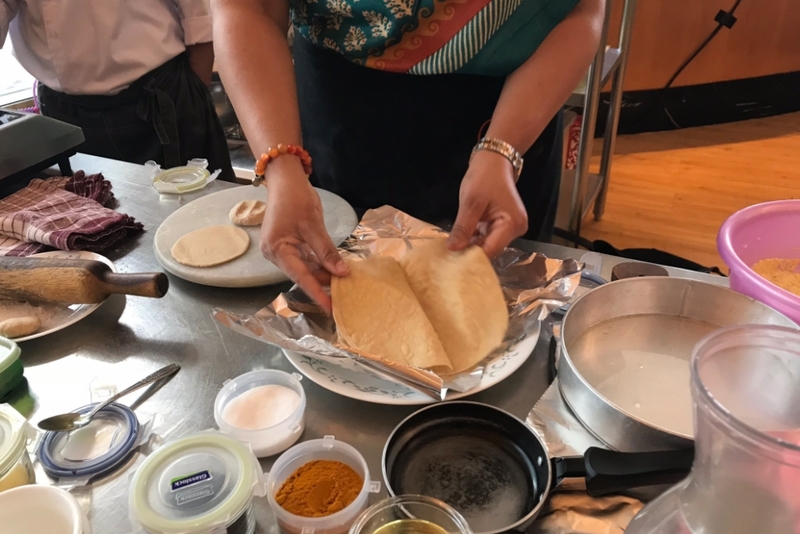 These chappatis as demonstrated by Ritu can be taken in your lunch box or stored in a casserole for a few hours – and they stay soft. 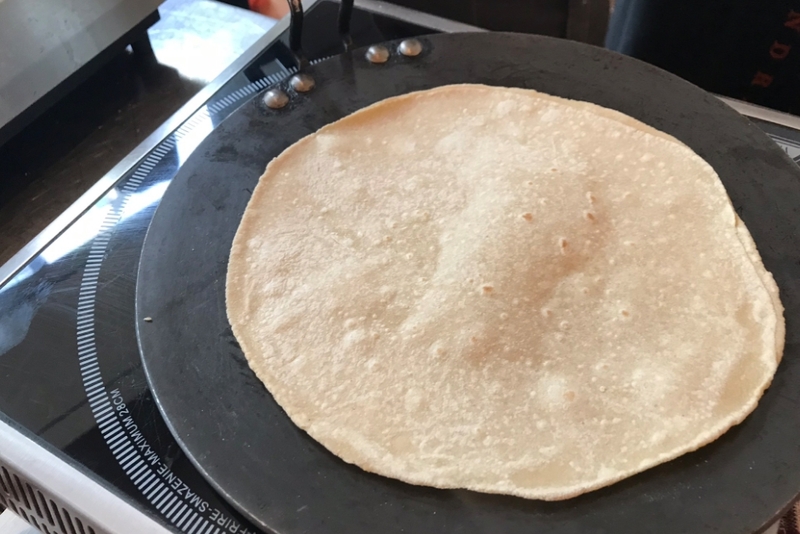 Another advantage of this method is that you get 2 chappatis each time and they are satisfyingly thin and soft – just right to eat with the accompanying curry etc. Mix the whole wheat flour along with salt and water in a medium bowl until the mixture pulls away from sides of the bowl. Turn the dough out onto a well-floured surface. Knead until the texture is smooth about 10 minutes. Preheat a skillet or tava to medium high heat. Divide the dough into 6 equal parts, form into rounds and cover with a damp cloth. Flatten the balls with your palms. Use a rolling pin to roll out 2 pieces of it into a 2-3 inch diameter round. On one side of one the flattened balls, apply oil properly on the whole surface and sprinkle flour on the dough. Put the other rolled piece over it where both pieces will stick together. Use the rolling pin to roll out the two pieces together into 6-8 inch diameter round. Cook the flattened dough disc for 1 minute before you turn it over. Turn it again after another minute. When you finish the cooking, the chapati will have darker brown spots. Put them on the plate and peel the 2 chapatis apart. Apply ghee on the cooked side and keep them in casserole to keep warm.